I’m slowly checking of the things I’ve wanted to make for Toasty as I wait here achy back and feet for when he decides he’ll to grace us with his presence. 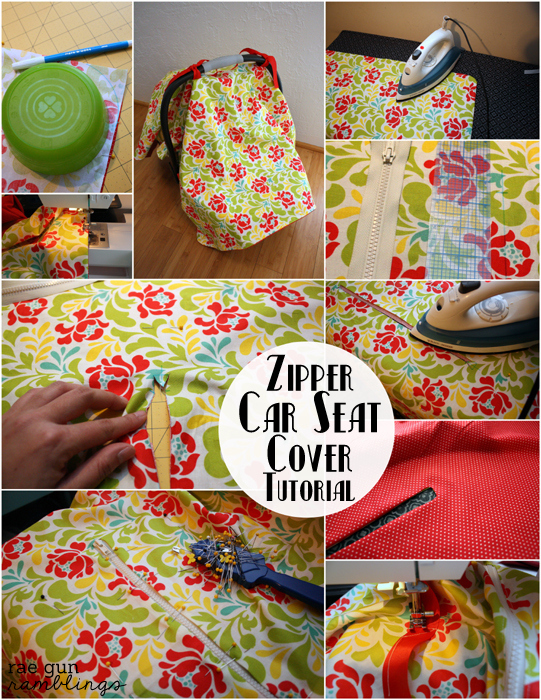 Today I’m sharing a super easy DIY zipper car seat cover. I’ve been hoarding this fabric for a while and even though it’s a little girly I figure the cover is more for me than him. I decided to add a zipper right in the middle so I can easily peek at him without moving the whole cover. It’s probably unnecessary but I thought it sounded fun. So if you want want to make one without the zipper it would go even faster! 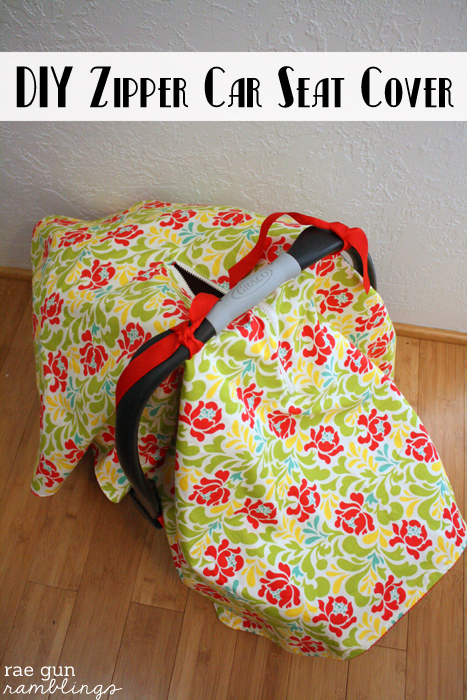 This fits my Graco Snug Ride Click Connect 35 car seat but I helped a friend make one for a different car seat a few years ago and we used the same measurements. Pin your fabric together right sides together. This will show you if the fabric lines up. You can trim them to match or just pin them so that the excess hangs outside the stitch line. Using something circular like a bowl mark round corners. See around all the sides leaving a 2 inch gap on one of the straight sides for flipping. Top stitch making sure to close the gap. If you don’t want to add a zipper skip down to Step 10. To add the zipper mark the center of the cover (you’ll want to have the fabric positioned with the smaller side up). I drew a line a little shorter than my zipper and then made a Y at both ends. Pin around the line just so fabric doesn’t shift when you’re working with it and cut through both layers. 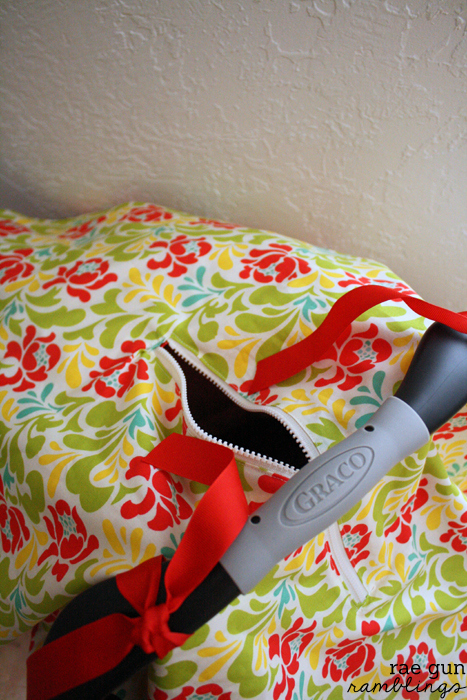 Tuck under and iron to make a space for the zipper. Sandwich in the zipper and pin. Sew around all sides. Mark where you want your ties. I put mine halve way down the cover a few inches out from the zipper. But the positioning depends on the shape and position of your car seat handle. Sew your straps down and you’re good to go. I absolutely love the little zipper window! My aunt was convinced I was suffocating my baby when using one of these, so I think she would love this! Oh goodness well I guess this next baby of yours gets a zipper then! Car seat covers come in SO SO handy!!! And yours is pretty too! Win-win!!! Love this!! 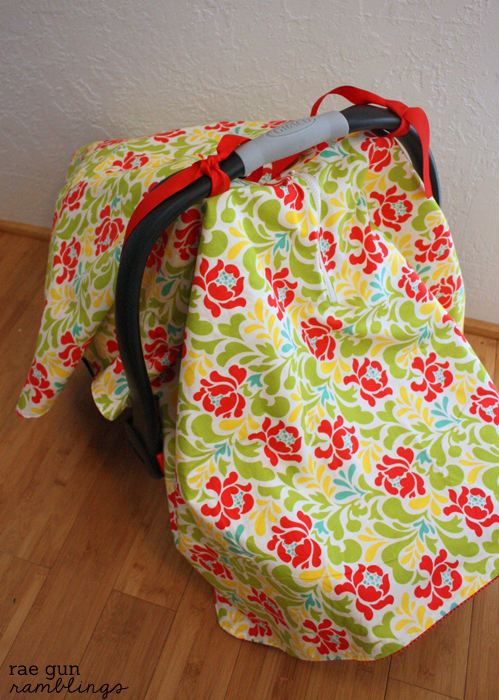 I wish I had something like this when my kids were younger – oh I also really love the fabric you chose! I love your cover! That zipper is a great idea. Wish I would have had one like this when I had my babies. Pinned! Thanks Amy I’m curious to see how much I use the zipper but I figured it was an easy add in so why not. The cover is beautiful! I love the zipper opening too! I always wished I had had one of these when dax was that small. It’s just nice to have a barrier between the baby and strangers. This is so so cute and I love the idea of the peekaboo hole! Marissa what a clever idea. You couls sell tons of these! I love this! I’m going to try to make this. I hope it comes out well as I’m a beginner sewer. 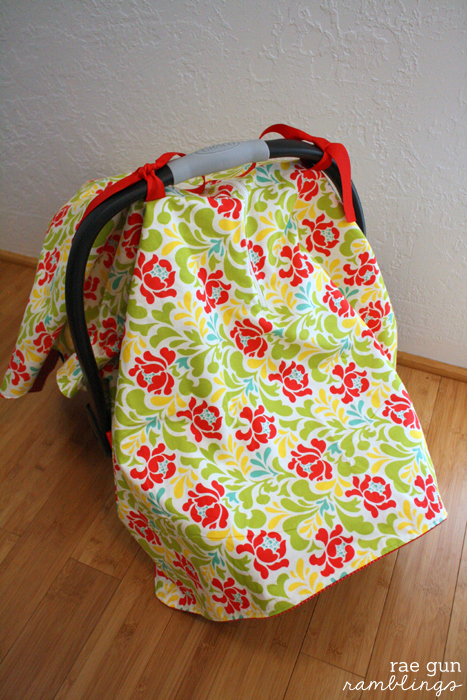 What type of fabric did you use for the outside and the underside?